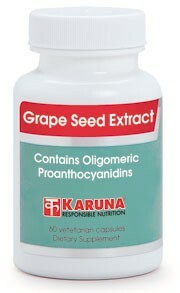 Grape Seed Extract provides a cost-effective concentrate of grape seed flavonoids (GSFs), including oligomeric proanthocyanidins (OPCs), upon which this extract is standardized. Human research has documented the ability of grape seed extract supplements to boost total antioxidant activity measurable in the blood (J Clin Pharm Ther 1998; 23:385-9) and to provide greater protection than combinations of other antioxidant nutrients (Ann N Y Acad Sci 2002;957:260-70). GSFs depress the activity of collagenase, the enzyme that degrades collagen, and have tonic effects on the capillaries and veins (Arzneimittelforschung 1994;44:592-601; Gazette Medicale 1985;92:96-100). Grape seed extract prevents changes in capillary permeability that could lead to accumulated fluid in the disrupted interstitial tissues (Ann Chir Polast Esthet 1984;29:393-5). The combination of antioxidant and connective tissue stabilizing effects of OPCs may be responsible for evidence of improved visual function in human studies of grape seed extract (Fitoterapia 1995;LXVI:291-317). GSFs have been shown by some studies to be among the protective agents in wine that provide wine-drinking populations with excellent cardiovascular health, in spite of diets rich in saturated fats and cholesterol (Clin Chim Acta 1996;246(1-2):163-82). GSFs have been shown to reduce LDL cholesterol oxidation and maintain normal arterial blood flow capacity in animal studies (Atherosclerosis 1999;142:139-49). A water extraction method of concentrating the grape seeds assures that no solvent residues remain after processing.